Oh what a summer! I’d almost forgotten what it was like to have weeks and weeks of warmth and sunshine. As expected, with the girls at home there was no blogging – I tried to keep up with blog reading, but even that eventually ran away from me, but things will return to normal – I hope! This is the new piece painted up – in alcohol inks. 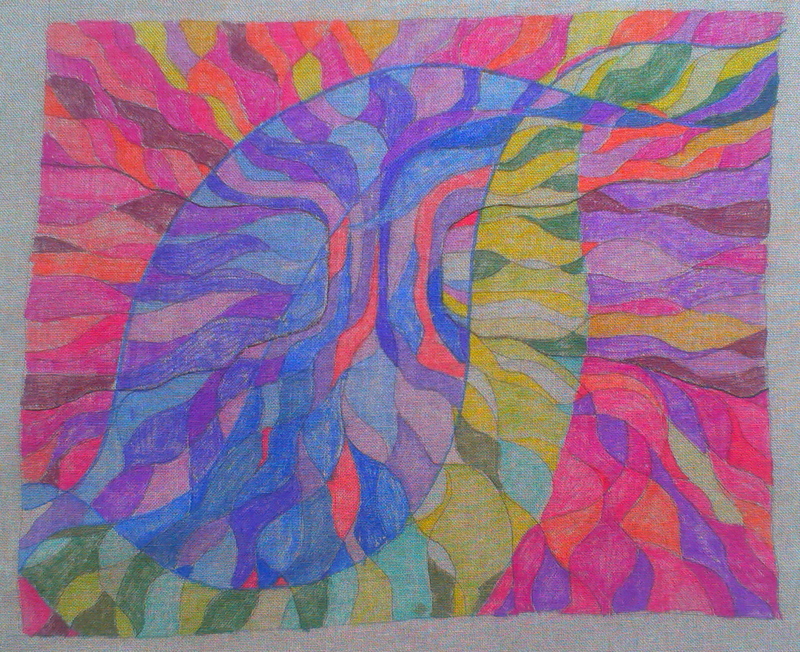 I’m sticking to the plan of using only tent stitch or derivatives for this piece (which also has no name as yet). There was so much texture in Splodge that I feel the need to go flat again for a while. But I am having a wonderful time trying out new yarns. In addition to the lovely yarns from Natalie Fergie, I’m also incorporating a couple from Victoria at Eden Cottage Yarns. They are perfect for working in this linen scrim and give me the tonal variations I was looking for. It seems to me that this is the route I’m going for the future – needlepoint yarns are fine, but there is so much variety and texture available from knitting yarn dyers – it’s a wonderful resource for people like me – and using so much, it makes far better sense to buy larger quantities. 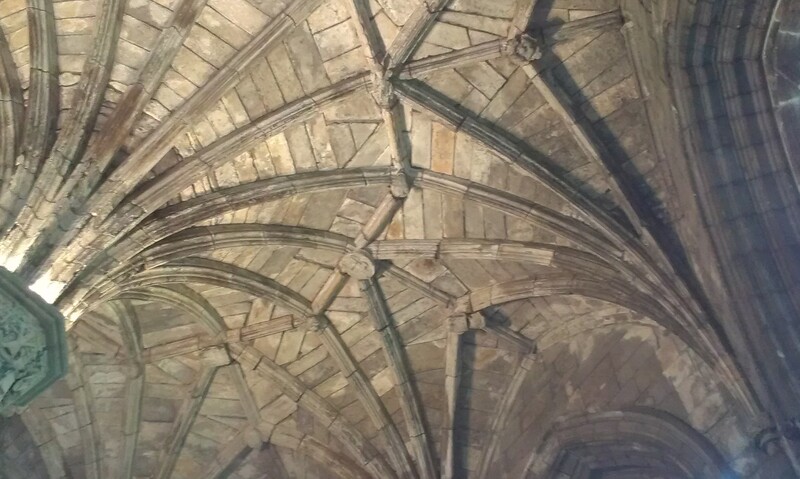 The roof of the Chapter House – Elgin Cathedral. It’s good to be back. Happy stitching. Beautiful – the colours are stunning. Thank you – the choice of colours is so much more exciting now I’ve found some of these hand-dyers, and I particularly love the individuality of the yarns. I’m glad you like it. I was mesmerised by the patterns in the roof. That’s beautiful! I love the colour variations. I’m curious (and ignorant) – do you mean you are using knitting wool? If so, are you separating the strands? Your roof photo is lovely too – it looks like a pastel drawing! Hello Catherine, yes it is 4ply knitting wool and I just use it as it comes. The linen scrim that I’m using as a canvas has a very flexible weave – I like it, but it would drive you mad if you wanted to stitch in straight lines! The 4ply seems to be just the right thickness. Welcome back! Your stitching is lovely – I look forward to seeing more and also the phots. I am always snapping photos of things that interest me. It drives my children crazy. My phone definitely gets more use as a camera than anything else – I sometimes think my brain likes to store up the images in the hope that one day they’ll come in useful. Never a bad thing to have eccentric habits with which to annoy the children – mine often pretend we’re not together. Hello Jill, yes indeed the scrim moves in ways that John Travolta would envy, but it’s that very flexibility that I enjoy. I’m learning naughty little ways to tame it a bit, but don’t go anywhere near it if distortion worries you. 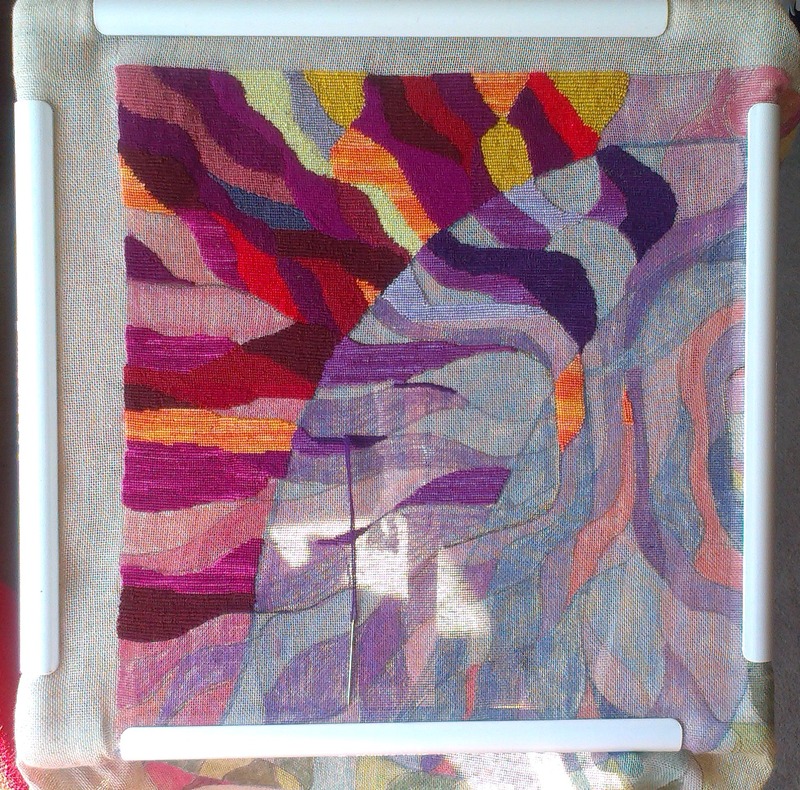 There are ways to incorporate straight lines – oversewing cocktail sticks or similar for example, which I might try at some time. Oh I’m impressed – you are a brave woman! Good luck, I think you’re going to love it. Great idea to use knitting wool – the variations in tone are lovely and make the pools of colour so much livelier. My phone is mostly a camera too and I just love the shot of that fan vaulting. Oh yes, I’m having enormous fun trying out various knitting wools – the dyers seem to have their finger on the pulse as far as colour and texture are concerned, you just have to be careful about the robustness (is that a word?) because the canvas can shred loose yarns, but even then there are usually ways to use them slightly differently. Welcome back. “Random photos” is a wonderful idea.